What is GI vs. AA balance? Number of GI samples per each anti-aliasing sample. Higher values will make global illumination and light noise clean up faster, while lower values will make the antialiasing, motion blur, and depth of field noise clean up faster. Setting this value under 2 or above 64 is not recommended. 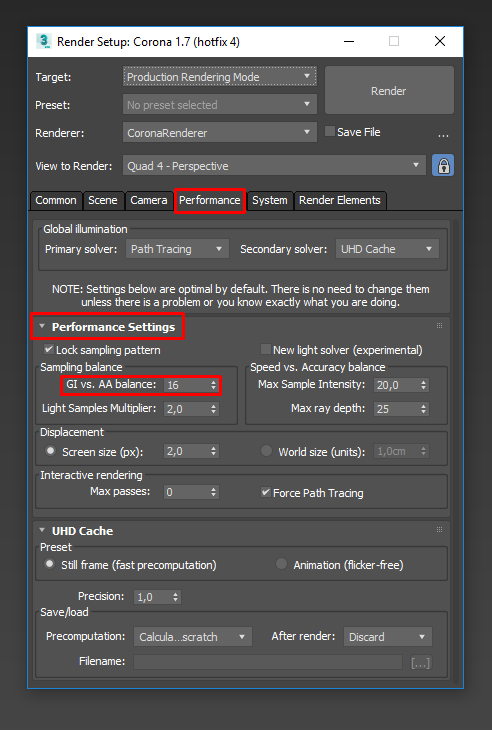 Render setup > Performance > Performance Settings > Sampling balance. Render Settings > Corona > Performance Settings > Sampling balance. It specifies the number of GI samples per each antialiasing sample. 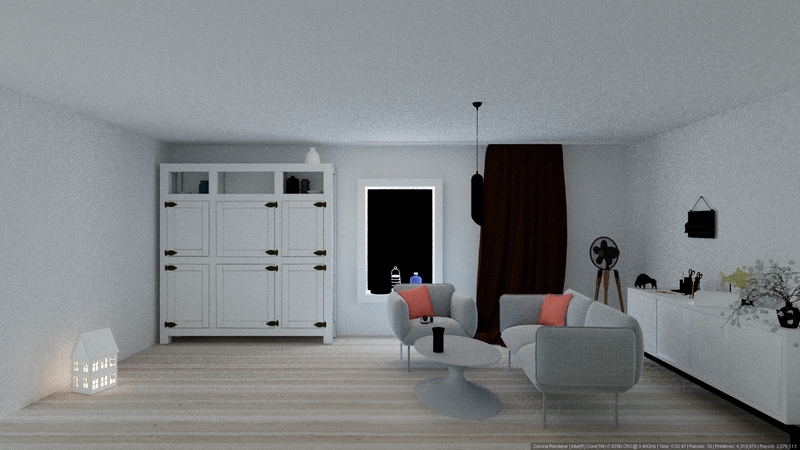 One antialiasing sample is cast for each pixel during one render pass. Total amount of samples is dependent on Light samples multiplier and GI vs. AA balance values. If Light samples multiplier is set to 1 and GI vs. AA balance is set to 16, this means that 16 GI samples and 16 direct light samples will be used for each pixel per pass. If Light samples multiplier is set to 2 and GI vs. AA balance is set to 16, this means that 16 GI samples and 32 direct light samples will be used for each pixel per pass. In some situations it makes sense to reduce one of these values and increase the second one, or even to reduce both. Typically, there is no need to increase GI vs. AA balance above 64 and Light samples multiplier above 4. GI vs. AA balance should never be lowered below 2. 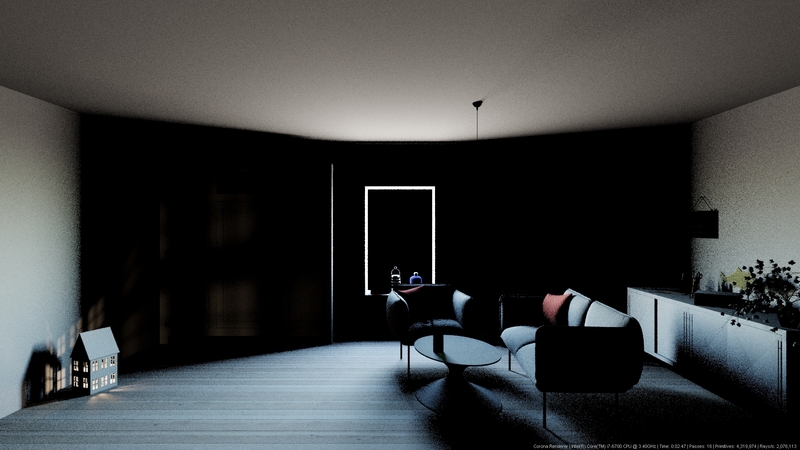 The default value of 16 works well in most cases, but sometimes it should be increased if there is more noise in indirect light areas, or decreased if there is strong DoF (3ds Max | C4D) or motion blur (3ds Max | C4D) in scene. 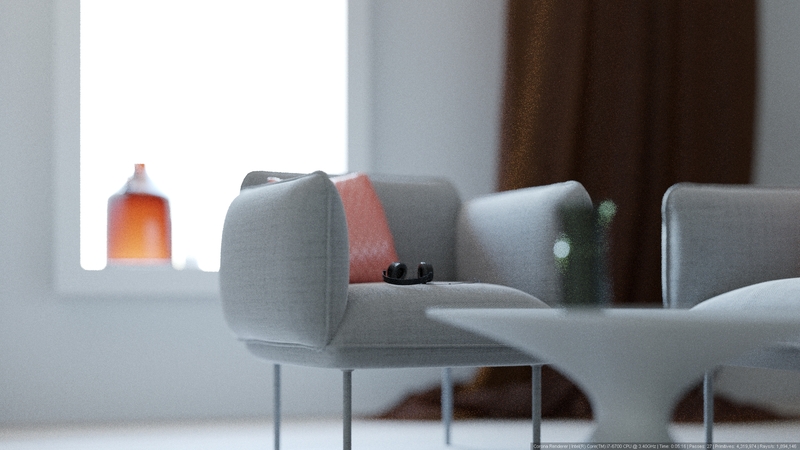 Note: GI vs. AA balance works in correlation with Light Samples Multiplier (3ds Max | C4D). 16 samples are used for GI and 16 x 2 = 32 samples are used for direct light. 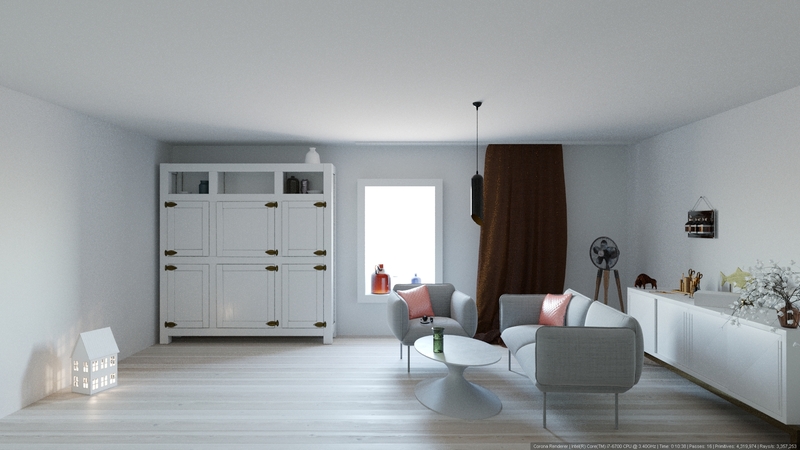 These are the default settings of Corona Renderer, which offer good balance between GI and direct light quality. They will work fine in most interior and exterior scenes. The same number of samples (16) is used for both GI and direct light. Note that the quality of GI the GI pass remains the same as when using the default settings, but the quality of the direct lighting pass is lower. Render time is also slightly lower. The same number of samples (4) is used for GI and for direct light. Note that the overall quality of the image is much worse than with the default settings, even though the number of rendered passes is the same (16). Render time is much lower. 64 samples are used for GI and 64 x 0,25 = 16 samples are used for direct light. When compared to the default settings example, it can be seen that the GI pass has higher quality (at the cost of render time), and direct lighting pass has lower quality. 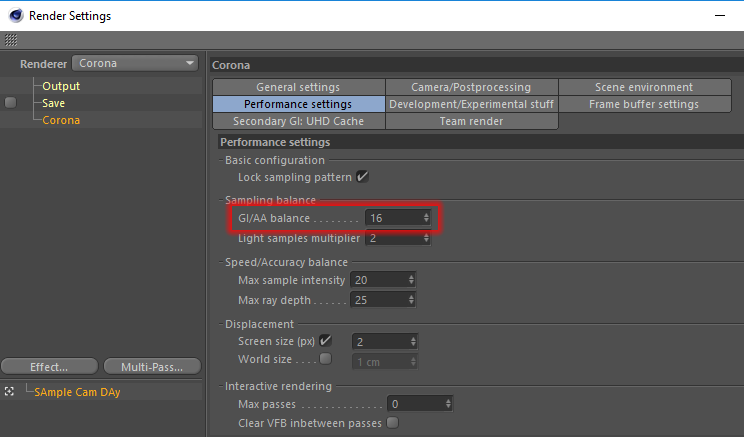 The default value of 16 samples is used for GI and 16 x 4 = 64 samples are used for direct light. After comparing, it can be seen that the direct lighting pass has higher quality than the indirect lighting pass. GI vs AA lowered to 4, LSM 2.